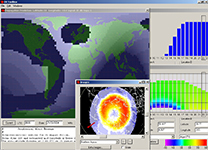 The propagation program “DX ToolBox” with most of its windows opened, including images and bulletins downloaded from Internet. Foreword. This review was written in 2003 for version 2.2.0. Today DX Toolbox is at version 4.6.0. A demo version can be downloaded free of charge. Its interface is similar to the version tested below. Note that an old register number cannot be applied to the new version. In what shape is the ionosphere today ? IWith my modest means, I searched long time for the answer without finding it. So, one day I decided to search a program and useful information to prepare my DX hunting or simply to understand why a band was suddenly dead and subject to a blackout during some hours or some days. Browsing the Internet I usually partly found the explanation in a warning message dealing with the state of the geomagnetosphere or with the solar activity found on a public website. This information is long to compile and I had to connect almost in real-time to a handful of professional websites (NOAA, IPS, ULCAR, PIXIE, Spacew, and others) to get a clear view of the event that happened… To avoid this tedious search I created my own interface, a summary status sheet where these data are automatically downloaded, but not all. As my sheet was not complete, I needed of an integrated product that provided me all the required data online at the simple click of a mouse. In addition I needed of a propagation program as realistic as possible and using a user-friendly GUI. By chance, browsing the Internet I found a small program that I installed in a few seconds, not memory hungry, occupying less than 15 MB on disk and called “DX ToolBox” from Black Cat Systems. It works on Windows and Mac OS plaforms. With “DX ToolBox”, that we will shorten in DXTB in this review, is one of the simplest and quite interesting propagation prediction program. It is an excellent complement to other amateur products (see the review) as its views or maps are different but complementaries to those provided by these programs. The installation of DXTB is straightforward : you downwload the full version from the publisher’s website as a zip file, you unzip it and run the exe ! There is not setup and directory to create with a complex and long installation procedure. All the application keeps in 5 files representing 14 MB on disk. This is excellent and up to now the version 2.2.0 of the program runs perfectly and without errors on my Windows XP Home Edition v2002, even while other applications memory hungrier are running. At first sight I didn’t understand how it worked. I didn’t want to read the short manual because I desired an intuitive and easy to use product as soon as the first run and I didn’t desire to dive hours long into a tedious and complex manual to setup tens of parameters to create a prediction, as other products do. After a few minutes of concentration on its various submenus and several trials and errors I managed at least the main functions of the product, and one hour later I mastered it… And in the forecoming minutes I was even positively surprised by all its capabilities… At least ! Although I had already some notions of propagations and astronomy (I am interested in these fields since 1970 or so), these knowledges didn’t helped me to master this good-looking and user-friendly application. This is an application rather intuitive that requires at the end relatively few inputs. So I can say that it is really accessible to everybody and provides updated information. Therefore I decided to register it and to show you its performance that deserve a try, even if in some circumstances forecasts are not always reliable. But many other products, even professionals, show similar gaps. What surprised me first is the fact that DXTB displays a first window with the current solar and geomagnetic conditions. They were updated. How was it possible ? Was is a coincidence ? Not at all. The "Current Conditions" window when an Internet connection is up. 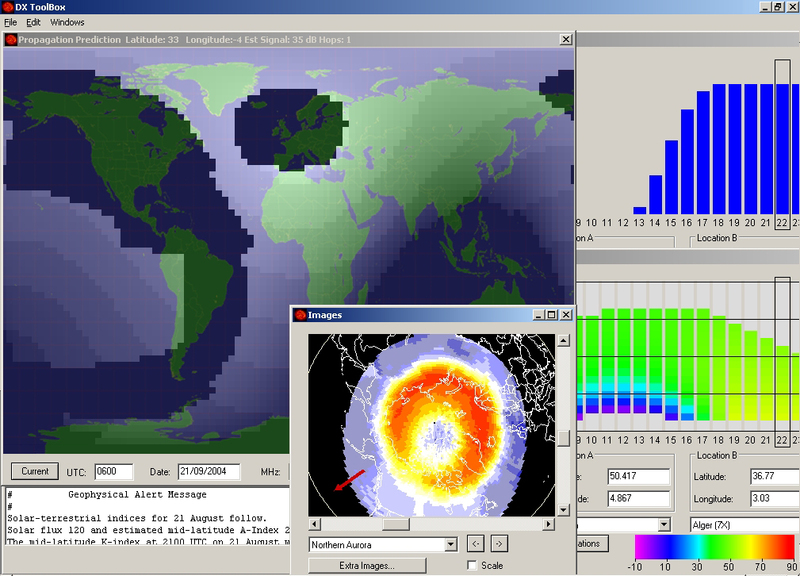 In fact if your computer is connected to the Internet, DXTB searches on the web for the information that it needs on solar and geomagnetic activities that affect radio propagation. This connection is done in background without user intervention, hence the magic of this display. DXT provides indeed several tools (submenus) taking advantage of these readings to create propagation forecasts and to display real-time reports and images. An active Internet connection is thus warmly recommended to use DXTB in optimal conditions because as soon as you request some features related to the sun activity, the systems refers to its “Current Conditions” window, and thus to online data. 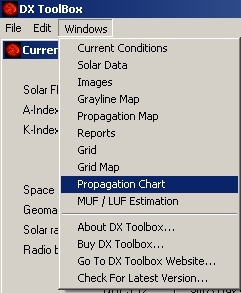 If you have no Internet connection you can hopefully use the program in entering manually the solar flux in the “Propagation Chart” window but avoid to deliberately request to check the solar and geomagnetic data or you will get a fatal error that will close immediately the program. We will come back on this feature. If you have no information about the current solar flux download this F10.7 chart prepared by SWPC listing expected values for the current sun cycle. °In addition these values can be plotted through submenus. When you run the 12.6 MB DXToolBox.exe file, a main greyish window appears displaying the current conditions, I mean the current solar and geomagnetic data. Except this window, the menu is empty and you wonder how it works…. So in a first time you instinctively browse the menu and discover a first “Edit” menu in which you set your preferences (Latitude, longitude and UTC offset) and later your registration code. 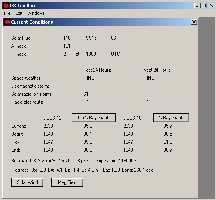 The UTC offset cannot be simpler but I had preferred that the product uses for example the Windows standard (e.g. (GMT+01:00) Brussels, Copenhagen… ) and the standard TZ as do all serious applications. But this is a very minor detail and the way it is used is really simple and auto-sufficient. Go with it. In addition you can check the latest releases, go to the publisher website or access the help (a PDF file) from the application. Voilà for short all options of this application. This is altogether few and much, depending on your needs. In practice I think that with all these data you have enough information to sched a good QSO with a DX station and be informed in real-time about the status of the space environment and the one of the geomagnetosphere; you have all the information at once at your fingertips up to the indigestion, Hi. This is a plus and one of the two reasons (the other being the graphical user interface) that pushed me to select it among my favorite propagation programs. But before going further and deeper into this product, come back a few steps behind to review the default window, “Current Conditions”, from where all begin and then all other cascading ones that depend on this one. The “Current Conditions” window is the HQ of this application where all real-time readings are compiled and keep updated by the system. The refresh is automatic and each minute DXTB updates its data in connecting to predefined web servers. This window must be opened all time, even in staying in the background. If you close it, it will reopen as soon as the system will need a real-time data to calculate its forecasts. Smart it is ! This is a measurement of the Sun energy recorded at certain radio frequencies (2800 MHz, etc). A high flux (made of plasma, hydrogen clouds, electrons, protons) directed towards earth will have a strong impact on the ionosphere up to warm the lower levels of the atmosphere (down to 100 km aloft) what will alter the trajectories of satellites and create severe disturbances on the ground as well (on gas pipeline, aerial traffic, cellular communications, etc). Higher is the solar flux, better will be the level of ionization and thus the propagation conditions via the E and F layers. Higher is the ionization, higher will be also the frequency at which shortwaves will be reflected by the ionosphere layers (MUF). 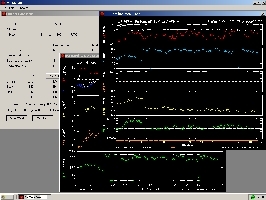 At left, the "Current Conditions" window is the HQ of DX ToolBox because this is the window where all readings are gathered in real-time to allow the system to create its forecasts. All data are automatically searched on the web and come from two GOES satellites, 10 and 12, monitoring the sun activity from the earth orbit. 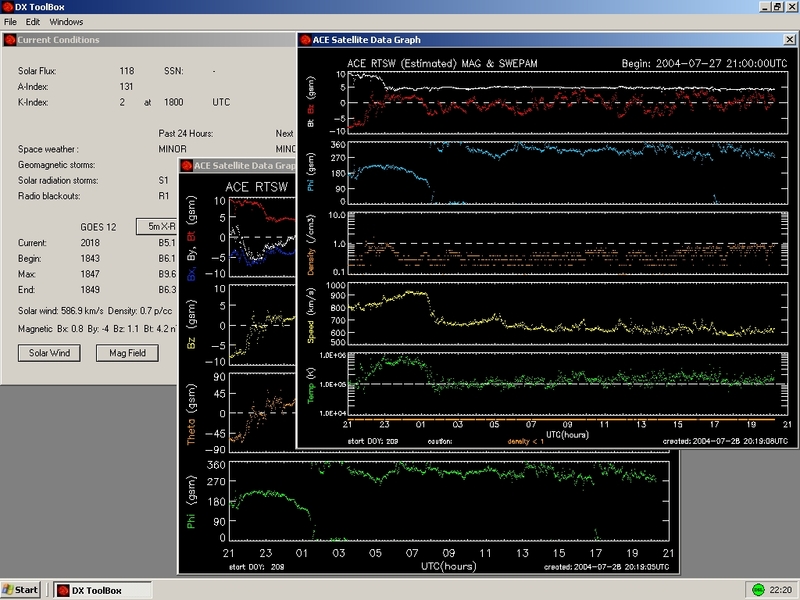 In addition, the solar and geomagnetic readings are also displayed (solar wind speed, geomagnetic Bz component, etc). 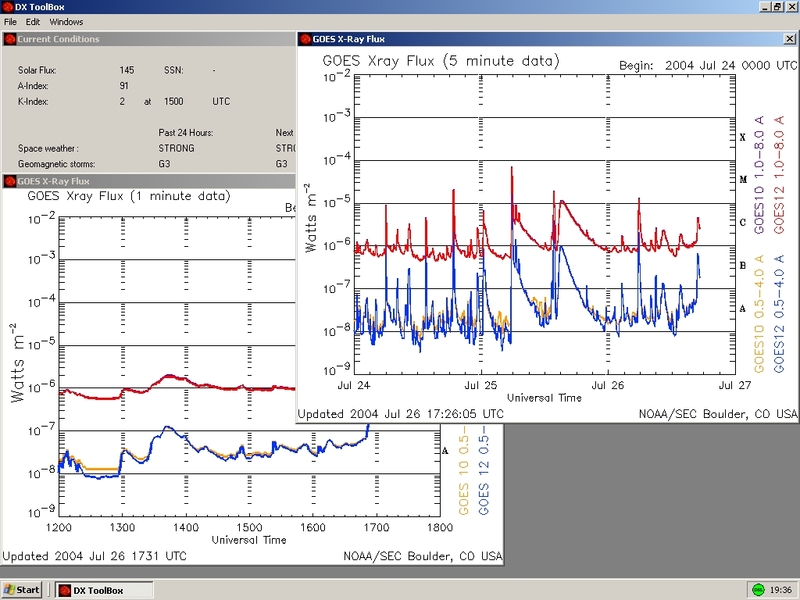 In the background the 1 and 5-minute X-ray flux showing some sunflares of C and M-classes. No blackout or shortwave fadeout to expect, maybe some noise, even though. At right, two additional windows named "Solar Wind" and "Mag Field" have been included in v2.2.0. This is the "planetary index", often noted Ap. It is the mean value of the low geomagnetic activity including a 12 hours forecast. When the geomagnetic field is disturbed, showing high values, propagation conditions are altered. A-Index is ranging from 0 to 400. This index is calculated daily at the end of the day. Also know as Kp, like A-index this a measurement of the activity of the geomagnetic field but it gives a forecast for the next 3 hours. This value depends also on local conditions. This data is acquired from two GOES satellites orbiting around the earth. They are correlated with the activity of solar flares. DXTB provides the current readings, as well as the time, duration, the intensity and the location of the last flare in heliocentric coordinates. Two additional buttons are provided : clicking on 5m X-Ray Graph button will bring up a window showing the X-ray flux as recorded from the GOES satellites orbit at a 5-minute update rate. The X-Ray Graph button updates each minute. The most interesting graph is the 5-minute X-ray plot that allows to foresee solar eruptions of C-, M- and X-Classes that are usually available on SWPC/NOAA website too. Monitoring the X-ray activity is very important because a high level of X-ray generates much noises on bands, and when they are associated to huge flares (also visible in white light) they may cause radio shortwaves fadeouts (SWF) and even blackouts up to VHF if the flux is very fast and directed toward earth. 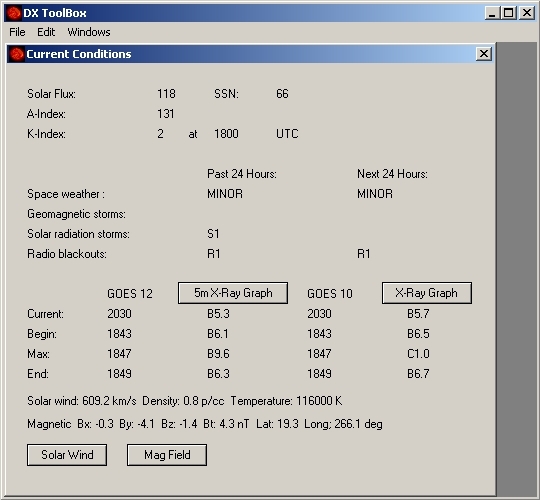 In release 2.2.0 on DXTB two more buttons are provided in the "Configuration Conditions" window, Solar Wind and Mag Field to access respectively to the ACE Solar wind and magnetic field data as displayed at right. At last various readings related to the solar wind and geomagnetic activity are shown : solar wind speed, proton density, temperature, geomagnetic Bz and Bt component, etc. These data are correlated with the solar flux and coronal mass ejection (CME) from the Sun. The most important is the Bzcomponent of the geomagnetic field which, if pointing south (negative) with a high K-index, means a deep alteration of the geomagnetic field with possible auroral events and radio blackouts. STD Aurora Monitor from the Spacew is one of them that requires some habits to master it. WinCAP Wizard sold by Kangaroo Tabor Software in another one, but already more accessible for the amateur. It can be mastered without consulting the instructions in a few hours of practice.